WHERE: Academy of Music Theatre 274 Main Street Northampton. Every year, Django in June brings serious students of the Gypsy jazz tradition to Northampton for a week of djamming and study with world class musicians. On Friday and Saturday night those same artists offer us all a grand finale at Northampton’s historic Academy of Music theater. Here’s what we have in store for you on this, our 15th anniversary. Please join us! On Friday, the Mathias Lévy Trio—made up of Lévy (violin), Sébastien Giniaux (guitar and cello) and Jean-Philippe Viret (bass)—kicks things off with selections from their program, Revisiting Grappelli. The reference is, of course, to violinist Stéphane Grappelli whose interplay with Django Reinhardt helped launch the Hot Club genre and has inspired countless jazz violinists. Post Django, Grappelli’s long career went on to span many styles, so expect a diverse program performed by musicians of extraordinary sensitivity and depth. Then Tcha Limberger (guitar, violin, vocals) hosts clarinetist Giacomo Smith. Tcha was born into one of Belgium’s great Gypsy jazz lineages and carries on that tradition with boundless energy and creativity. Whether you like your Gypsy jazz neat or with a twist of New Orleans, these superb performers are going to leave you stirred. 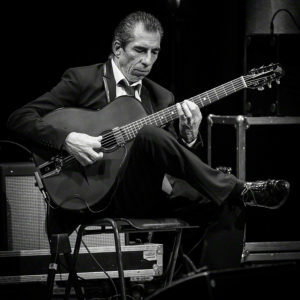 We close this year with one of the most influential and respected Gypsy jazz guitarists of the last four decades, the legendary Angelo Debarre. Since the release of his 1989 album, Gypsy Guitars, Debarre has helped define and set the standard for contemporary jazz manouche. He will be accompanied in this rare US appearance by his son, Raangy and longtime bassist, William Brunard. The evening opens with two Django in June favorites: Gonzalo Bergara (guitar) and Fiona Monbet (violin.) Gonzalo first joined us as a fiery young talent a decade ago, back when Fiona was taking home SACEM’s Jeune talent award year after year. Now fully ripened, these two delicious artists promise to pair perfectly.